World news in 1932 was dominated by the deepening Great Depression and turmoil in German politics. Adolf Hitler’s Nazi Party surged in national elections but he was refused the reins of power although, an Austrian by birth, he was finally granted German citizenship. In India the British Viceroy arrested both Gandhi and Nehru for agitating for independence and Gandhi began a hunger strike which while not ending British rule certainly marked the beginning of its end. In the United States the depression was tightening its grip and the country in November elected Franklin Roosevelt, then governor of New York, to his first term as President. When he took office unemployment was 25%, the average monthly rent was $18, gas was a dime a gallon and a loaf of bread cost 7 cents. During 1932 Al Capone finally saw the inside of a federal prison and Bonnie Parker of Bonnie and Clyde fame was arrested for burglary but released. She then teamed up with Clyde in a spree of robberies which left 2 lawmen dead. Charles Lindbergh’s baby, Charles Jr was kidnapped in February and found dead in May resulting in a sensational trial. Amelia Earhart became the first women to fly the Atlantic solo and Hoover ordered General Douglas MacArthur to forcibly evict the veteran’s “Bonus Army” from the Washington Mall at substantial loss of reputation for all involved, not to mention several dead and many injured. In baseball babe Ruth “called” his legendary home run in the third game of the World Series, pointing to the spot in the right field stands where he promptly deposited the next pitch. Eddie Rommel, an A’s relief pitcher, was called into a game in the second inning and pitched a record 16+ innings in relief to win the game. In entertainment Johnny Cash was born and George Burns and Gracie Allen had their debut on the Guy Lombardo Show. 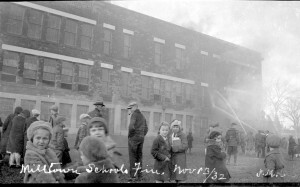 Fire inspectors and detectives from St John were called in to investigate but had little success in locating the “fire bugs”. None of the kids in this photo appear to be likely suspects. School buildings in the area had a habit of burning- three years later the Calais Grammar School burned and in 1945 Calais Academy was completely destroyed by fire. 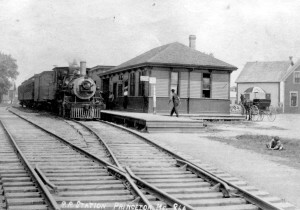 In November of 1932 the Maine Central abandoned the line from Woodland Junction to Princeton citing an operating loss of $18623 for the prior year and noted that “the public has virtually abandoned these branches as far as passenger service is concerned”. 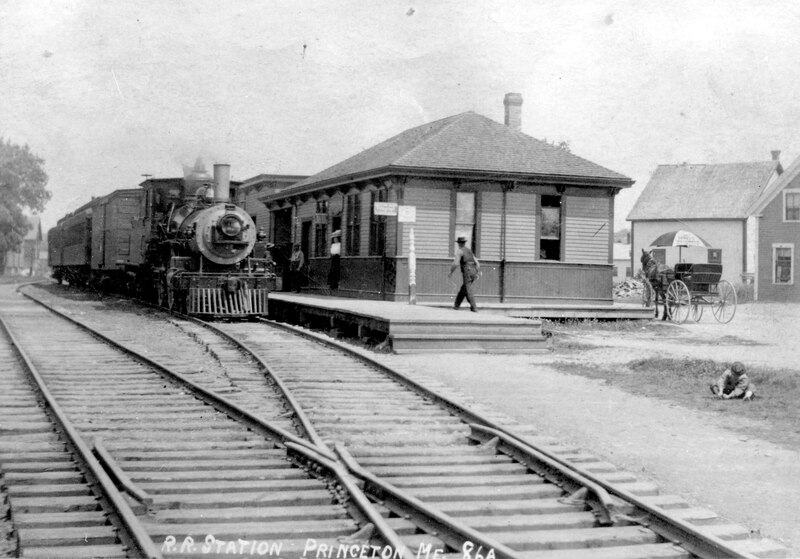 The same fate was soon to befall passenger service between Calais and Woodland and eventually all passenger service in Eastern Washington County.The advertising umbrella to the right of the station is promoting Daniel’s Distemper Drops, an early 1900’s cow and horse medicine for coughs, colds, fever and distemper. As it contained 25% alcohol and a large dose of Belladonna it was probably good for farmers too. There is naturally a tone of nostalgia and longing for the old days in Mr Kneeeland’s address as is proper on such an occasion.His mention of the “frontier” does deserve some comment. 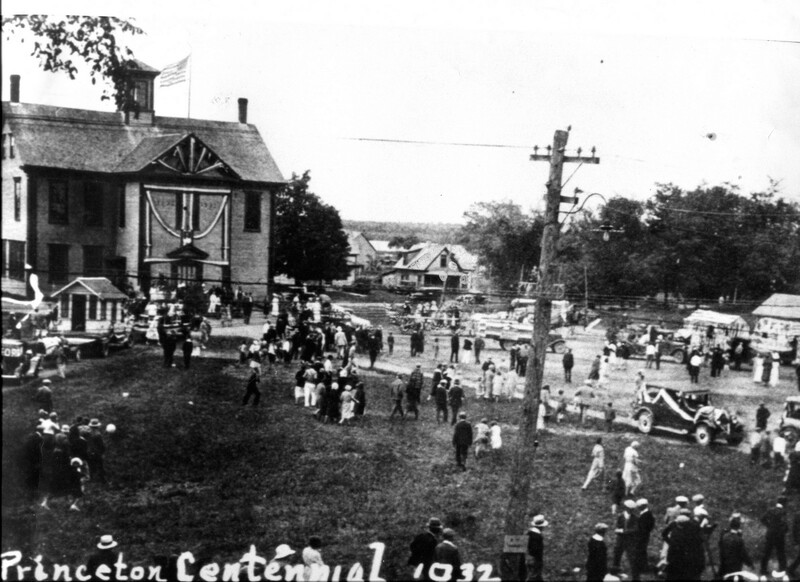 Princeton was a “frontier” town in its early days, as rough and ready as any of the western towns so romanticized in fiction and film. It took a special sort of person to endure its hardships and privations of those early days. 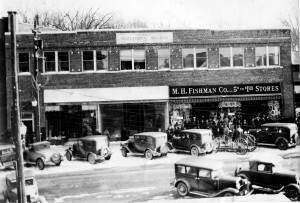 The Unobskey Professional Block on Maine Street was completed in 1932. It is still occupied by businesses on the ground floor, including Border Subz, and several professional offices on the second. It was the last of the brick blocks built by theUnobskey family over the years in Calais. 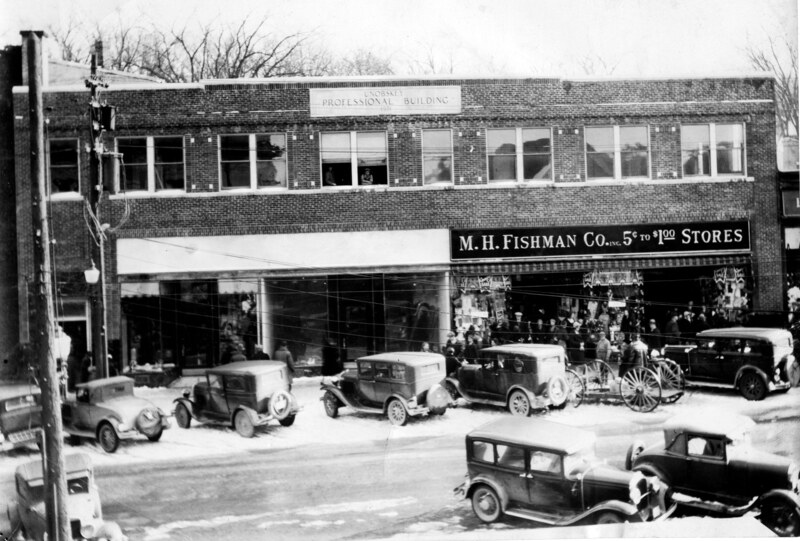 Note the horse drawn wagon in front of Fishman’s. Even in 1932 the horse was not completely obsolete and it was not uncommon to see a horse and wagon on the streets of Calais into the 40’s. 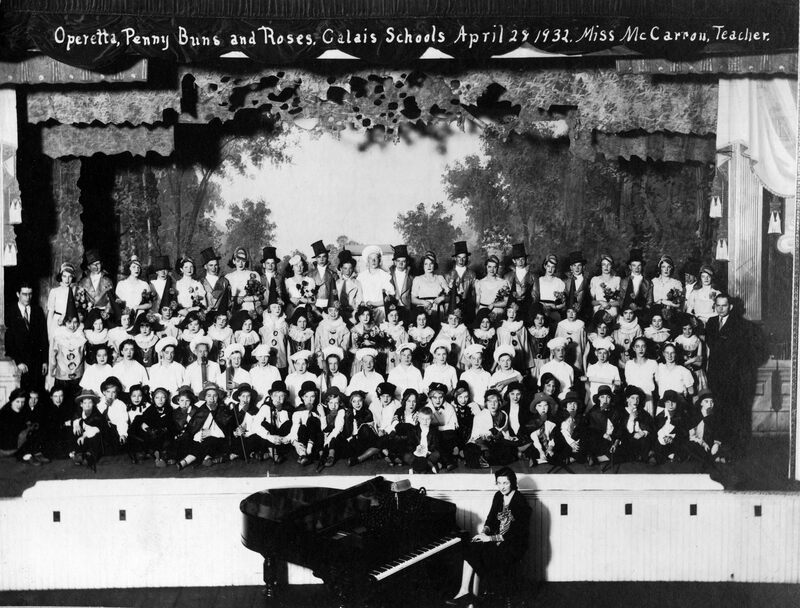 In 1931 a young lady named Gertude McCarron was hired as a music teacher in Calais. It was her first position and she made the most of it. 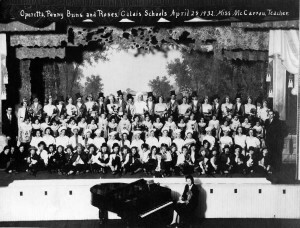 This 1932 operetta was performed at the Opera House on the corner on Main and Church Street. In other local news the Old Eastport bridge collapsed under the weight of Border Express freight truck cutting Eastport off from the world for a couple of weeks. A Perry bootlegger, George Talbot was found murdered in his home in early October and a number of suspects were rounded up but not charged. Suspicion eventually fell on a couple of Eastport boys, John Brown and Norris Whepley who found themselves on trial in Machias in December 1932. The jury acquitted both defendants. In Calais George Steeves, son of the local plumber Earl Steeves, came home to find his wife Mirian standing at the top of the stairs with a rifle. He asked his wife “What are you doing with my gun?” and went up the stairs apparently with the intention of taking the rifle but Mrs. Steeves shot him and turned the gun on herself. Both died leaving 4 children aged 12 to 18 months. The Advertiser testified to Mrs. Steeves good and kind character and said she “ at the time of the tragedy was undoubtedly suffering from mental derangement”.